He also went on to say that the visitors are not entirely dependent on the Indian captain. Before the start of the much-talked five-match Test series between England and India, the spectators and all the greats were very excited to witness the thrilling clash between Indian skipper Virat Kohli and the England veteran fast bowler James Anderson. It was expected to be a battle between the two titans in their respective department and surely the rivalry has lived up to all the hype so far. India’s premier batsman tackled the sensational bowling spells from his counterpart in the first Test to smash a spectacular hundred, while Anderson was also relentless and kept on beating him outside the off-stump with his accurate lines and lengths. The pacer bowled an amazing spell last night to rattle the visitors, as he picked up the 26th five-wicket haul of his 140-match Test career. On his nervy battle with Kohli on the field, the premier English bowler revealed that he has enjoyed every moment of this contest so far. He mentioned that he likes to play and test himself against the best players in the world like the Indian skipper. 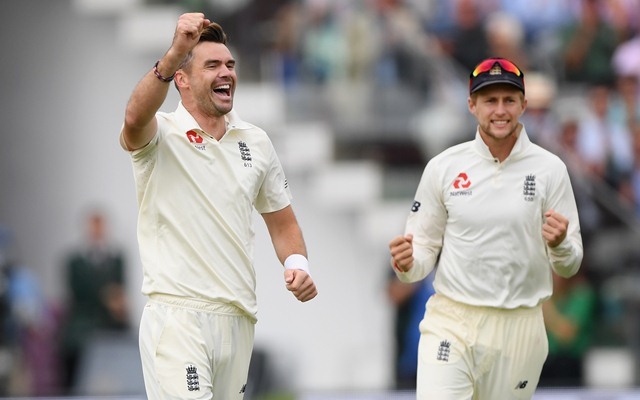 James Anderson revealed that he will keep on trying his best to get the better of the opposition’s top batsman for the rest of the series. “It is a really thrilling thing to be a part of, and unfortunately, I have not got the better of him yet, but I will continue to try my hardest throughout the rest of the series,” he said while addressing the media after the second day’s play at Lord’s. The 36-year-old also stated that he does not feel that the Indian batting line-up is much dependent on Kohli. He reckoned there are many quality and skilled players in their line-up but admitted that the No. 1 batsman is the vital cog. “I don’t think you can think like that (dependency) because we’ve played against all of them before. There are some real quality players in there. I think Kohli is important because he is captain, a leader and he is their best player — number one in the world. But 90 per cent of their top seven have scored runs against us in the past so we can’t look just as Kohli as a big wicket,” he added. For more news alerts, follow CricTracker.com.